Super Smash Bros Cafe to be at E3? Will Super Smash Bros for the Wii 2 be displayed at E3? Yes, if we are to believe the website Gaming Crusade who apparently have sources within the industry. According to their sources Nintendo will be showing off a new Super Smash Bros game for the Wii 2 at E3 this year. They did not share any other details about the game. As with most rumours I suggest you take it with a pinch of salt (or maybe a skip load full). However, a Super Smash Bros for the Wii 2 is pretty much a given, we just don’t know when. Josh has also brought to my attention an image that is meant to be from the game, for you to muse over. E3 will reveal the truth, so I guess we’ll just have to wait and see. 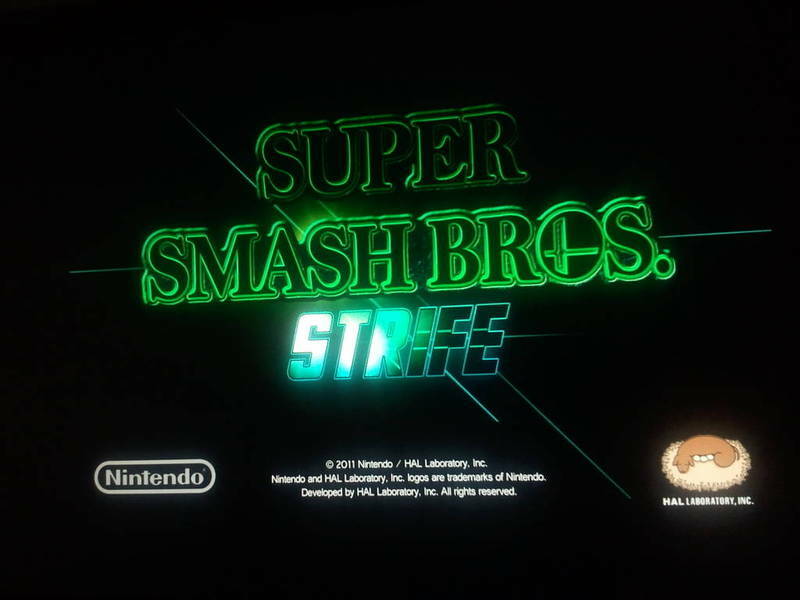 Super Smash Bros Strife… got a nice ring to it. Okay, I think you meant 2011-2012. …right now I’m trying to contain myself until I actually hear the news from Nintendo. (deep breaths). The image is WAY too convincing. o and by the way theres already a mod of smash well kinda like a hacked vertion called strife GOOGLE IT THIS IS FAKEEEEE!!! link? ive seen hacks that include strife (cloud strife) but never a hack by that name. Agree. It’s CLOUD Strife in BRAWL, not the rumored game. Besides if you don’t see or hear any news about it at e3, then you can consider it fake. I hope that this game can be a Wii 2 Launch title. With HD graphics it could be the big launch title that the 3DS kind of lacked. Many people hope that this rumor is true. That “Strife” image has nothing to do with the Gaming Crusade article. They only said a new Smash Bros. might be in the works. Some jerk just decided to make that Strife logo and attach it to the story, so aim all your flames toward them. Gaming Crusade did nothing other than point out a new Smash Bros. as a possibility, making it only a little more than an assumption. Seriously, it’s not that big of a deal. The one who made the image is a jerk, and we’ll see if the next game is in production yet @ E3. he didnt say it was a possibility, he claimed it was fairly likey based on his sources. also yes if someone did make photoshop this image then they are a little harsh, but theres currently no proof either way on the image. my suspission is that if it were in a playable form by e3 it would have had to begin development in 2010, meaning it should have a 2010-2011 copyright not just 2011, the sort of mistake a photoshopper would likely make. I guess I could’ve made that clearer. Alright, it’s a likely possibility. Also, there may be no proof but the date error and the fact that said Mod version exists are still reason to believe it’s fake. Wow, I hope that image is real! I love the color scheme! Fake. But calm down people. We will get our smash bros eventually, I bet 100,000,000 fake dollars…. The image is probably fake but the game might not be. A SSB game for the Wii 2 is pretty much a given. nintendo has the domain nintedoxtreme.com registered and currently redirecting to there main page. I hope not. It’s a terrible name for a console. Besides, Nintendo of America own over 2000 domains, so I don’t see why this would be the name of the console. I would love to hear of super smash at E3, and with a new HD console I am sure along with Mario, Zelda, Metroid it might be one of the first games we see, unless Nintendo finally uses this opportunity to start up some new IP’s, But at this point, as much of gamer as I am, I am an engineer and industrial designer at heart and right now all I care about is the console design, dimensions, components, functionality, and the controller, not the games so much. I hope this Smash Bros will let there be 3D battles instead of 2.5D. I’m 50/50 with this one. The copyright should be 2011 only if it’s the E3 demo which what I’m hearing is the case. The pic is too small on my phone. There should be no other date on it. Guess we’ll find out soon enough. ign just posted yet another smash bros story http://uk.wii.ign.com/articles/117/1170362p1.html again leading me to believe there might be some weight to the smash at e3 rumours. 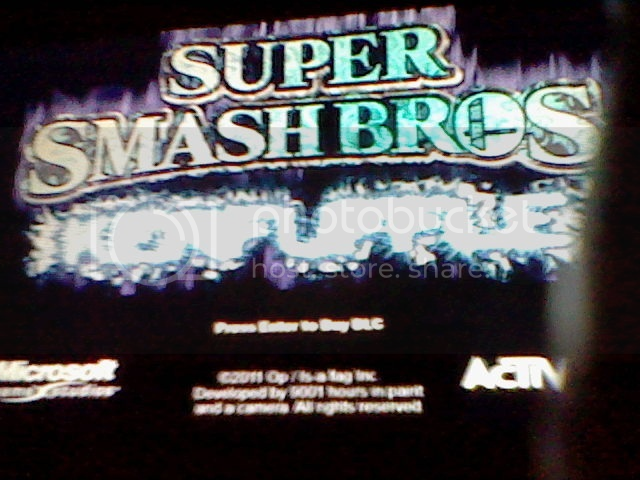 Here is another supposed leak according to a guy that posted on 4chan. unless the picture you linked was photoshopped, this rumor just got a lot more legit. It’s actually VERY easy to fake things like this. IGN has posted a third article on the Smash Bros series. In addition, Play Magazine has tweeted that a huge fighting franchise is supposed to get a new title announced at E3. I’m getting more and more hopeful that this is true. Here’s an idea I’ve had in my mind for a while. More than likely, Nintendo will EVENTUALLY have Street Fighter characters in Super Smash Bros. so I believe Nintendo will have to step things up a notch from Brawl to make this game BETTER overall. I suggest throwing in 3 Final Smashes instead of one. The Street Fighter characters are know for having MANY signature Super Moves, so lets assume that the Nintendo characters will also have more Super Moves this time around. Working off this idea will open up MANY new Final Smash ideas for ALL the fighters!!! We will assume that the 3 Final Smash system will work like the 3 Super Move system works in Street Fighter III: Third Strike. At the character select menu, players will have the choice of selecting one of three Final Smashes. Depending on which Final Smash is selected will result in certain conditions for breaking the Smash Ball. Final Smash 1: Shinkuu Hadouken – This will be Ryu’s most basic and WEAKEST Final Smash. It travels long distance and it’s easy to deal damage to opponents at a distance, BUT lets say it only does a maximum of 50-55% damage if it FULLY connects. HERE’S THE TWIST!!! For picking his “weaker” Final Smash, this allows Ryu to break the Smash Ball more easily than normal if he were to pick say a “stronger” Final Smash. Final Smash 3: Shin Shouryuuken – This move is OBVIOUSLY Ryu’s STRONGEST FINAL SMASH!!! The damage is insane!!!! Probably 105-150%…pretty much guaranteeing a K.O. if you land it. Landing it though is EXTREMELY DIFFICULT!!! Your opponent must be at CLOSE RANGE!!! IN YOUR FACE!!! They’d have to be pretty stupid to get caught by this, but if you’re a skilled SSB Ryu player…you can find ways of connecting with this DEADLY FINAL SMASH!!! Also, this move is made to hit only one opponent (Like Link’s Tri Force Slash) BUT if two or three opponents happen to be right in front of you…then they will also take damage from the move. Breaking the Smash Ball takes a while with this Final Smash selected. There you have it. That’s my idea. Each character will have 3 Final Smashes set in this type of way: A long distance move(A projectile of some sorts or a dash type move that only connects it you touch an opponent), a move for hitting opponents that have surrounded you, and a nearly instant K.O. move that’s VERY HARD to land and EASY to waste. How about more TRANSFORMATION type final smashes like Sonic turning into Super Sonic? Can you imagine Link turning into Fierce Deity Link? The Final Smashes don’t necessarily have to be in that order, but ALL characters will have 3 Final Smashes, and each one will have a sort of handicap for breaking the Smash Ball depending on which Final Smash you’ve selected. You know, this is interesting. Most of everyone wants Final Fantasy characters in Smash Bros., but MOST of the characters never appeared on a Nintendo platform. What if we thought of it like this? The Final Fantasy series is an entire series in one isn’t it? The only thing is that it has numbered sequels with different characters and storylines. I think this is were it gets confusing. The Final Fantasy SERIES started on Nintendo, but half of it’s characters weren’t on a Nintendo platform. Does this TRULY exclude the other half of Final Fantasy characters from making an appearance in Smash Bros. just because they were on a platform other than Nintendo or does the ENTIRE series -that started on the original Nintendo- give hope that ALL Final Fantasy characters have a chance to make an appearance? Again, the Final Fantasy SERIES started on Nintendo. Would this FACT help open the door for more Final Fantasy characters?